Brandon Belt doubled to lead off the 18th inning and scored on Erik Kratz’s one-out, fielder’s choice grounder, as the San Francisco Giants beat the Colorado Rockies 3-2 Friday night but yet the people aren't happy because of after-game fireworks. Though it was Fireworks Night at Oracle Park and the city warned residents that fireworks will go off around 10-10:15 p.m., no one predicted the game would go to 18 innings. The fireworks actually went off around 1:10 a.m.
Few of the announced crowd of 33,616 were still around when the 5-hour, 35-minute marathon game ended at 12:50 Saturday morning. The Giants said the game matched the longest played in Oracle Park. Many residents took to social media to express their frustrations over the loud noise which woke them, their babies and dogs up. "Thanks for waking everyone up. How is this not a violation of the noise ordinance?" resident Ross Lazerowits wrote on Twitter. A few people thought the fireworks sounded like gunfire or an explosion. "I’m in the Oakland Hills and thought we were all about to die," Elizabeth Clark tweeted. "I legitimately thought there was a crash, some buildings were exploding or we were under some attack due to the loud sounds heard in San Francisco," another resident said. San Francisco, where there are people who think its ok to randomly have firework at 1AM. It's a world where no one have sleep disorder, work weekend, or have babies or dogs. #SFGiants is not cool in this case! Is this approved by @SFgov? @OracleParkSF? @SFPD? But some poked fun at those not-so-happy spectators. "Anyone complaining about the #fireworks display should move to Walnut Creek. Fireworks after an 18th inning game is a once in a lifetime event. Enjoy it! Even at 1:00am." said Juan del Real. 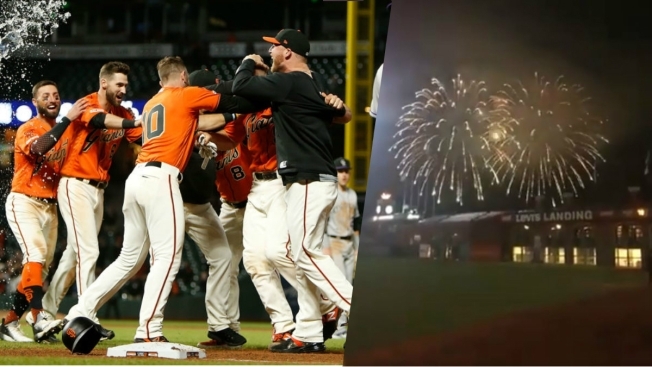 The Giants have since issued an apology and said the team will work on a new policy, with the hope to have one in place before the next fireworks display. "We have initiated discussions to adjust our fireworks policy particularly under circumstances where games run much longer than expected. We sincerely apologize for the disruption," the team said in a statement. But at least Giants fans can celebrate the team's first back-to-back win this season. After Belt doubled and two batters were intentionally walked to load the bases, the Rockies went to a five-man infield, bringing in center fielder Ian Desmond. Kratz hit a slow grounder to Desmond, who had to run to his left before throwing home. Belt slid in safely, but Rockies manager Bud Black immediately asked for a replay. A brief replay confirmed the call.